Our product range includes a wide range of noodles making machine and vermicelli making machine. We are well known enterprise instrumental in manufacturing and supplying highly demanded Noodles Making Machine. This machine is developed using premier grade galvanized steel to make it durable and easy to clean. 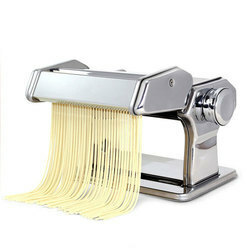 Equipped with crank handles and clamps, this machine process uniformly shaped noodles and can be ordered at an equitable price range.